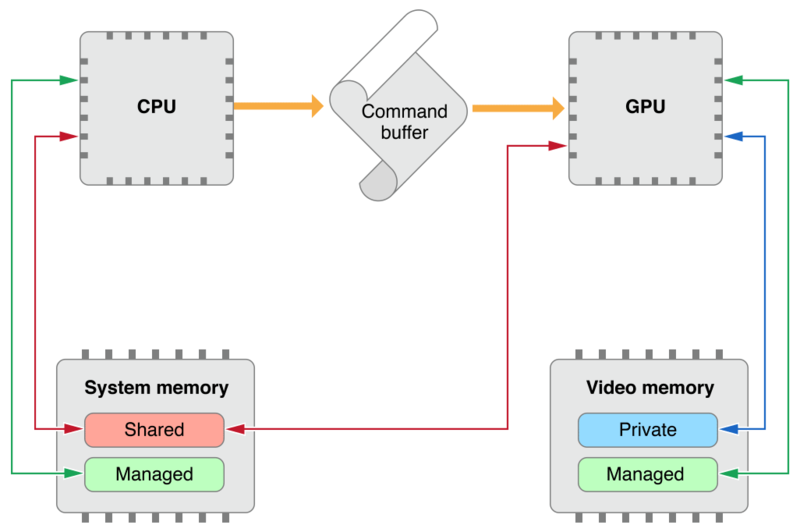 Today we look at how memory is managed when working with the GPU. The Metal framework defines memory sources as MTLBuffer objects which are typeless and unformatted allocations of memory (any type of data), and MTLTexture objects which are formatted allocations of memory holding image data. We only look at buffers in this article. makeBuffer(length:options:) creates a MTLBuffer object with a new allocation. makeBuffer(bytes:length:options:) copies data from an existing allocation into a new allocation. makeBuffer(bytesNoCopy:length:options:deallocator:) reuses an existing storage allocation. Note: the Metal Best Practices Guide states that we should always avoid creating buffers when our data is less than 4 KB (up to a thousand Floats, for example). In this case we should simply use the setBytes() function instead of creating a buffer. Metal resources must be configured for fast memory access and driver performance optimizations. Resource storage modes let us define the storage location and access permissions for our buffers and textures. If you take a look above where we created our buffers, we used the default option () as the storage mode. 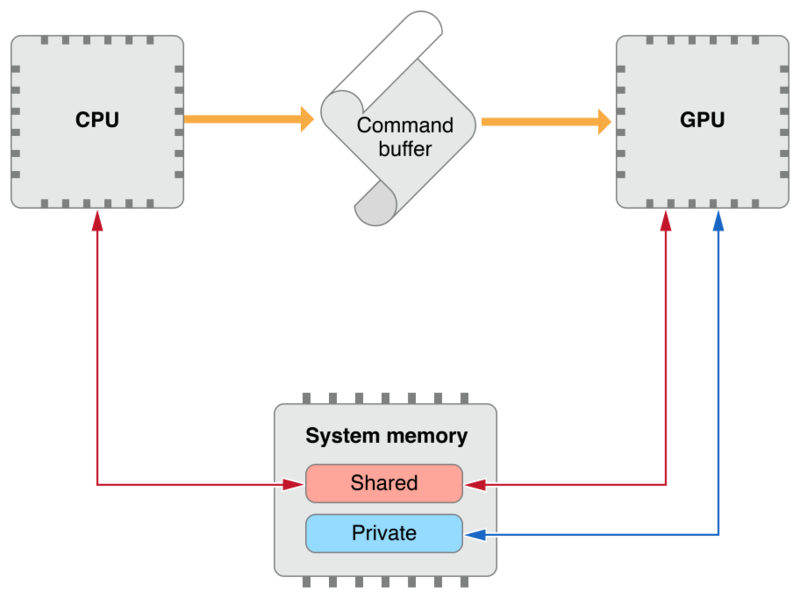 All iOS and tvOS devices support a unified memory model where both the CPU and the GPU share the system memory, while macOS devices support a discrete memory model where the GPU has its own memory. In iOS and tvOS, the Shared mode (MTLStorageModeShared) defines system memory accessible to both CPU and GPU, while Private mode (MTLStorageModePrivate) defines system memory accessible only to the GPU. The Shared mode is the default storage mode on all three operating systems. Besides these two storage modes, macOS also has a Managed mode (MTLStorageModeManaged) that defines a synchronized memory pair for a resource, with one copy in system memory and another in video memory for faster CPU and GPU local accesses. device - refers to buffer memory objects allocated from the device memory pool that are both readable and writeable unless the keyword const preceeds it in which case the objects are only readable. constant - refers to buffer memory objects allocated from the device memory pool but that are read-only. Variables in program scope must be declared in the constant address space and initialized during the declaration statement. The constant address space is optimized for multiple instances executing a graphics or kernel function accessing the same location in the buffer. threadgroup - is used to allocate variables used by a kernel functions only and they are allocated for each threadgroup executing the kernel, are shared by all threads in a threadgroup and exist only for the lifetime of the threadgroup that is executing the kernel. thread - refers to the per-thread memory address space. Variables allocated in this address space are not visible to other threads. Variables declared inside a graphics or kernel function are allocated in the thread address space.